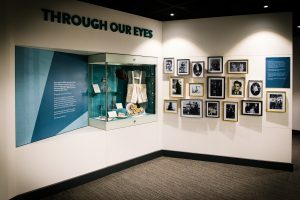 We have now had the honour of hearing the testimony of three survivors who feature in the ‘Through Our Eyes’ exhibition. Trude Silman, Arek Hersh and Iby Knill’s stores of survival are all unique but they share the message that the intolerance of difference can lead to devastating consequences. 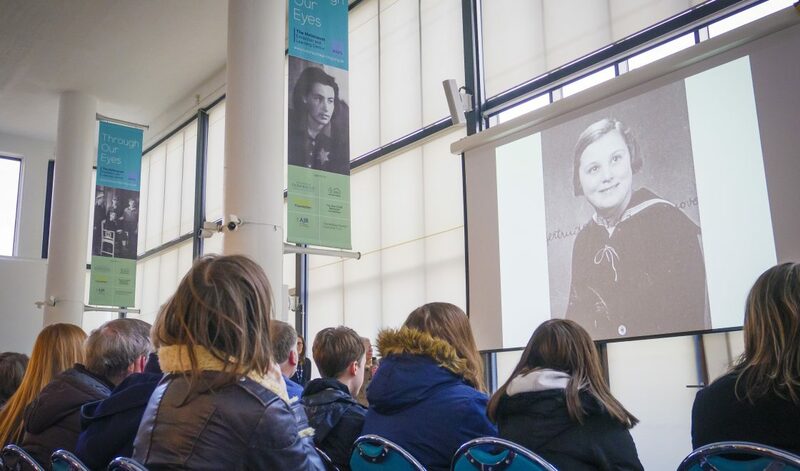 Trude Silman, a child Holocaust refugee, visited on Holocaust Memorial Day 2019 (27th January) and told the story of her escape from Bratislava. Although Trude, her brother and sister escaped the clutches of the Nazis, their mother and father were unable to follow their children to safety in the UK. Trude’s father was killed in Auschwitz-Birkenau and she is still searching for information about her mother’s fate. 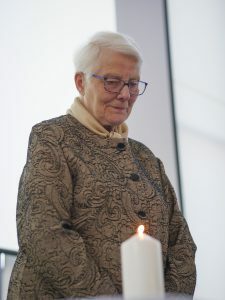 After her testimony Trude lit a candle in memory of her parents and extended family who were murdered in the Holocaust. 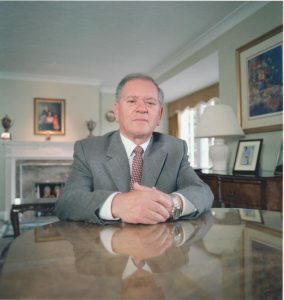 Arek Hersh, originally from Poland, survived the Lodz Ghetto and several concentration camps, including Auschwitz, before being liberated aged 15 from Theresienstadt. He then came to Britain as one of ‘The Boys’, a group of child survivors taken to the Lake District to recuperate and begin new lives in Britain. Arek shared his testimony with us on Sunday 3rd March. He started by showing a section of a film about his life created by Unison before continuing with his story. The audience then had the opportunity to ask questions which were answered by both Arek and his wife Jean. Arek’s final message for the audience was to encourage everyone to stand up to hatred in all its forms. 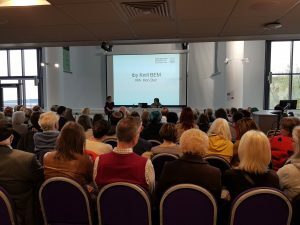 Most recently Iby Knill spoke at the Centre about her experiences as a young woman in Hungary. Iby experienced forced labour and concentration camps before being sent on a death march as the war drew to an end. She was liberated on Easter Sunday 1945 and a local child presented her with a painted egg. A symbol of new life given on a day when Iby’s life could begin again. After liberation she met a British army officer, Bert. She married and eventually settled in Britain with him. It took Iby 60 years to begin to tell her story but she has now shared it with thousands of people. 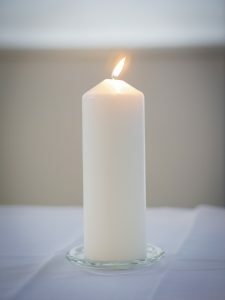 Iby hopes that by speaking to people from all walks of life she can promote understanding and acceptance of difference. She ended her talk by urging those in the audience to talk to those different from themselves, as we are all the same underneath and our differences only make us more interesting. We would like to thank everyone who has visited to listen to the survivors share their testimony. We hope to see you all at future events and appreciate your continued support. Our next survivor speaker will be Leisel Carter on 9th June. For tickets head to Upcoming Events.